Some of the dishes, in addition to ingredients, within them, be sure to call and special dish without which it is simply impossible to prepare. For example, it is hard to imagine Chinese beef with vegetables, made a simple pan, not on the island, or the famous Uzbek pilaf without a real cast-iron cauldron. Due to the fact that he's not cool, the dish is not brought to full readiness on the fire, and take off with it and left to "languish" for a while, so it finally "arrived". That is why rice and other popular Oriental dishes when you cook them in iron cauldrons, are such deliciously succulent and tender and have a totally unique taste. But once to start cooking in the cauldron impossible. Need to run some preparatory procedures before you start it in "business". Cast iron cauldron, oil, rock salt. 1. Warm up the cauldron on an open fire a few hours (2-3) to the engine oil is burned and out of the channels, the pores of cast iron. Do it better in the open air, as this generates a lot of acrid smoke. 2. Warm up the cauldron on the fire with 1-2 pounds of rock salt until, until the salt will not be a ruddy brown color. Salt throw. This method is more suitable for the interior. After that calcined the cauldron on the fire with oil. Pour into hot utensils 0,5-1 liter of oil (depending on the volume of the cauldron, you can take more), bring it to a boil. Wait until the bottom of the cauldron does not acquire a red hot hue. Then gently tilt it to one side and calcined thus the flank with one hand. Repeat this procedure on all sides to hot oil coated the entire inner surface of the bowl. It will take approximately 1.5-2 hours. Then, remove the cauldron from the heat, let it cool down completely, pour the oil. Lightly rinse the dishes with warm water without detergent and RUB with a clean cloth, oiled. Residues are soaked into the cast iron oil remove paper towel and wipe dry the cauldron. Now you can start cooking your favorite dishes. It is best for the calcination to use olive, cottonseed or special for deep fry oil. If you still decided to take the sunflower, then do not take cheap refined oil (it is worse withstands high temperatures) better to dwell on whether or more expensive variety. With continued use, the cauldron never RUB it with abrasive compounds and metallic sponges not to disturb the inner layer. Wash it in a small amount of warm water, a soft washcloth without the use of detergents degreasing means. After the first wash, wipe dry with a paper towel, and then with a cloth, oiled. 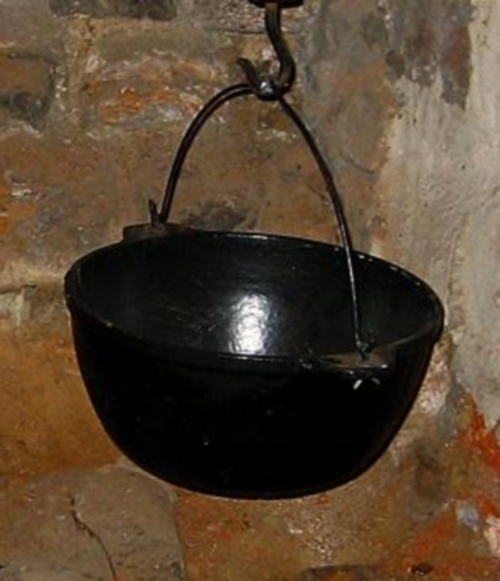 The right cauldron – cast-iron sure. It is in this real Central Asian dishes, such as pilaf or soup. But to enjoy their unique flavor, you need to prepare the cauldron to "work". First you need to remove the machine oil, which is usually coated cast iron cauldron manufacturers. Wash it from all sides in warm water, and then put on the fire a little more than average to hot. Be prepared for the fact that the cauldron will begin to smoke heavily. So it's best to bake it somewhere in nature. If you do it in the apartment, it is necessary to open all the Windows – if only the neighbors called the fire Department. 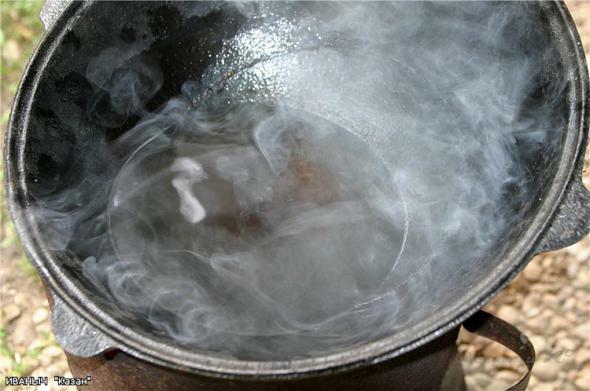 When the smoke dies down, pour in a cauldron vegetable oil – about 400-700 milliliters. Then slightly turn down the flame, let it be slightly below average. The cauldron must be heated. below its surface became slightly reddish. You can then distribute the oil on the inner surface. This can be done by slightly turning the cauldron. Be careful not to burn. If possible, hold the hot oil in different parts of the cauldron to prikalyvalo metal stronger. When you have finished this labor-intensive procedure, leave the cauldron to cool. Then drain the oil and check for hot or even Kazan. If it is cold, wash it with water without soap and a good wipe with a clean rag. It's ready to use, you can start to cook real Uzbek pilaf. Behind the cauldron to properly care. Never leave it uncleaned for the night, do not pour water to otmok. do not use for washing of potent chemicals. Just wash with warm water, to remove stubborn food residue you can boil and drain the water, wipe with a cloth soaked in vegetable oil. If suddenly the cauldron burn, it should be boil with water and salt for an hour. Salt need 1 kilogram. When it will darken and completely cooled, remove and repeat the procedure of calcination of vegetable oil that you did after buying the cauldron.